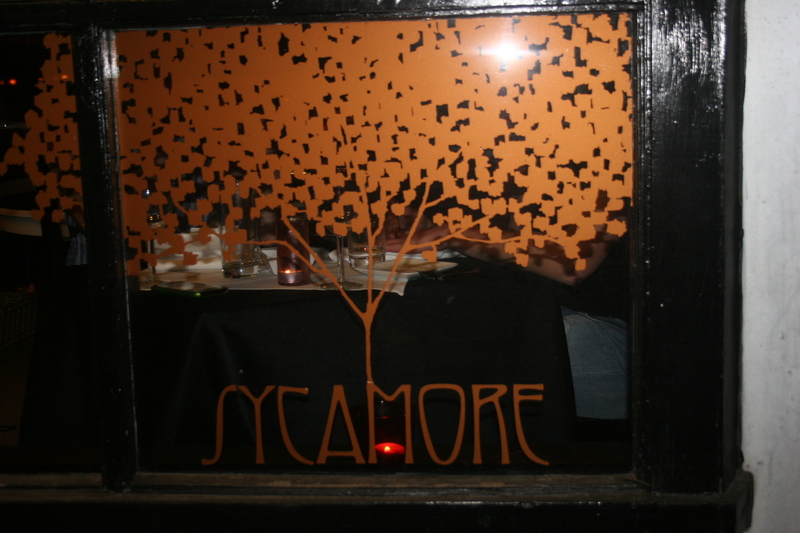 Sycamore Restaurant in Lansdowne, PA is not that hard to find. I managed to make a minor adventure out of it but a phone call from one of my dining companions guided me to the door. Tonight’s group was the childhood perv, oops, I mean, the guys I grew up with. We last met at Pesto on Broad Street a couple months back. This evening we were meeting at a BYOB within walking distance of our old neighborhood. Joining me were Steve J, Ange C. and Val S. Our fifth derelict, Frank D. was not feeling well and became a last-minute cancellation. Our wine for the evening were a couple of PA State Store Chairman’s Selections. 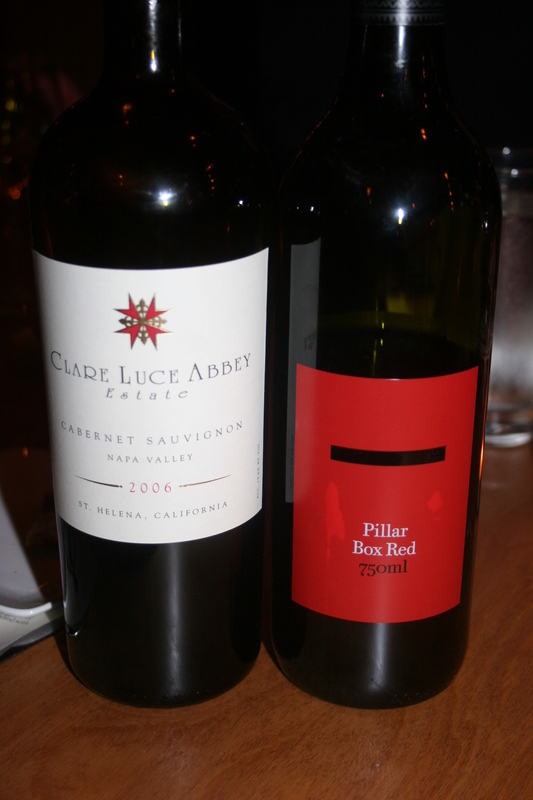 The 2008 Pillar Box Red and the 2006 Clare Luce Abbey, Napa Valley, Cabernet Sauvignon. Both of these reds showed lots of dark fruit, some pepper on the Shiraz blend and some smooth mocha on the Cabernet. I had previously had the Clare Luce Abbey at the Spring Mill Inn in Conshohocken back in 09. The Pillar Box has been one of my favorite QPR (quality/price/ratio) wines for many years and the crazy price that it is currently selling for as a Chairman’s Selection makes it a strong candidate for case purchase. 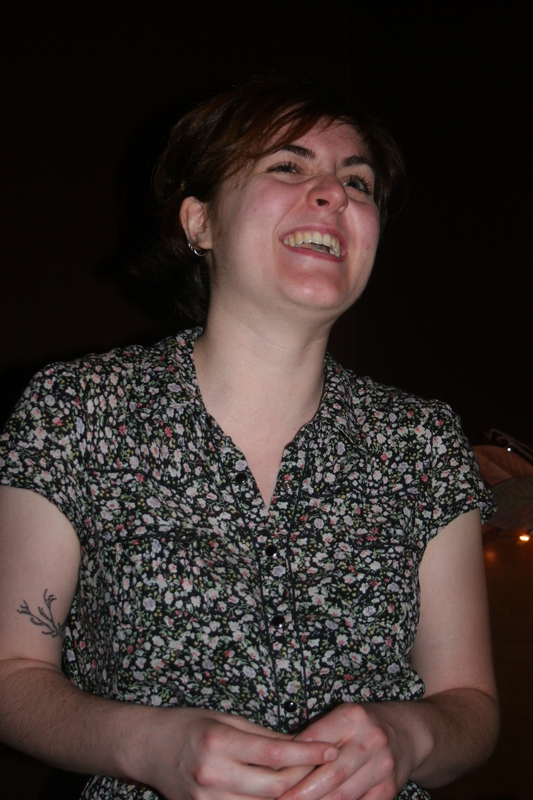 Our server, Elenore, wasn’t quite sure what to make of our group but to her credit she maintained her composure and good humor throughout the night. Sycamore offers a Cheese Plate, a Charcuterie Plate and a Combo Plate (3 cheese selections and two meats for $19.00) as an appetizer. The others all passed on appetizers but I ordered the Pancetta, Onion and Goat Cheese Tart, Phyllo Crust and Deep Carmelized Onion for $7.00. 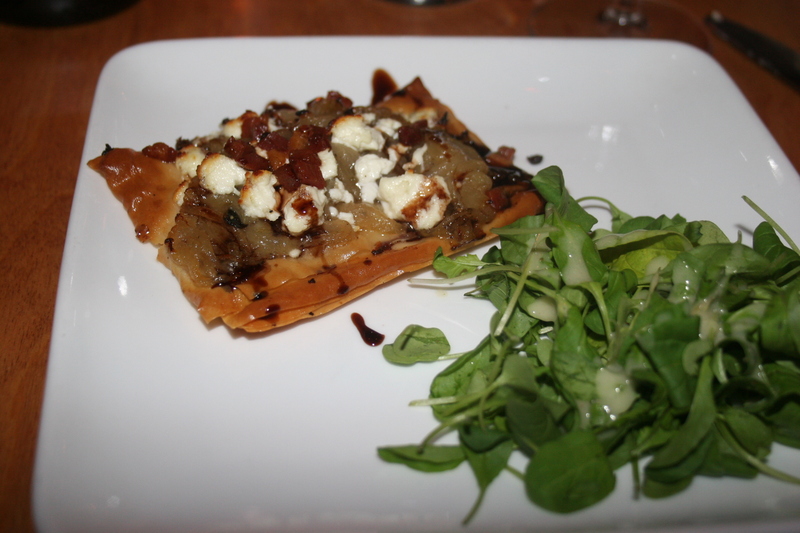 It proved to be a nice flavor combination with the crispy tart and tangy cheese and a few dressed greens on the side. Entree selection was a little more difficult. I was considering the chicken but it was served with scrambled eggs. There was another item that came with a fried egg. I am seeing this more and more and I have to confess I am not a fan of eggs with my dinner. In my mind, eggs are a breakfast item and should be limited to pre-noon meals. That’s just a personal flaw in my culinary make-up. Anyway, I quickly reduced my choices to the Scallops and the Crab Cakes. Elenore helped me settle on the crab cakes and it turned out to be a good choice. 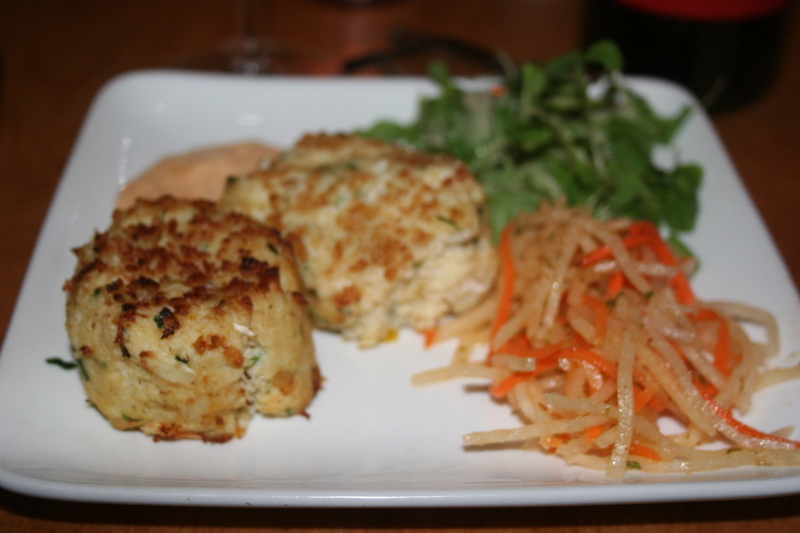 Two perfectly cooked cakes low on filler and high on crab were joined by the Chipotle Like Jimaca Slaw and a delicious Roasted Pepper Remoulade that was a great marriage for the crab cake. Ange C. also ordered the same dish and he too enjoyed his meal. 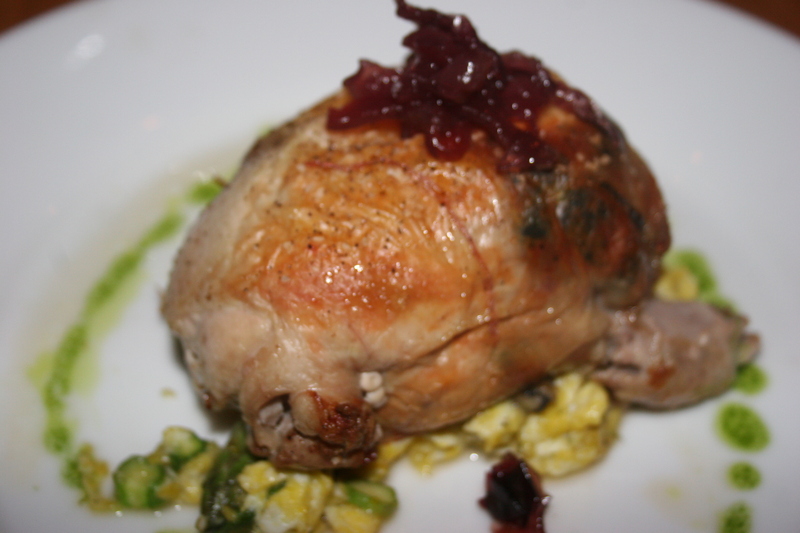 Val opted for the Poussin, Deboned Young Chicken, Stuffed with Seasonal Greens, Mushrooms and Brie, Scrambled Eggs with Spring Asparagus. As I mentioned earlier, I would have been unable to get past the scrambled eggs but Val found his dish flavorful and nicely prepared. He even paused once in a while in his story-telling to eat a bite or two. I was proud that he was able to feed himself without his wife, Patty being there. The guy is making real progress. Steve J. took time out from insinuating that my Grand Prize Win in the NCAA Tournament Pool run by my son, Brian was more than just good fortune and coincidence to place an order for the lamb. 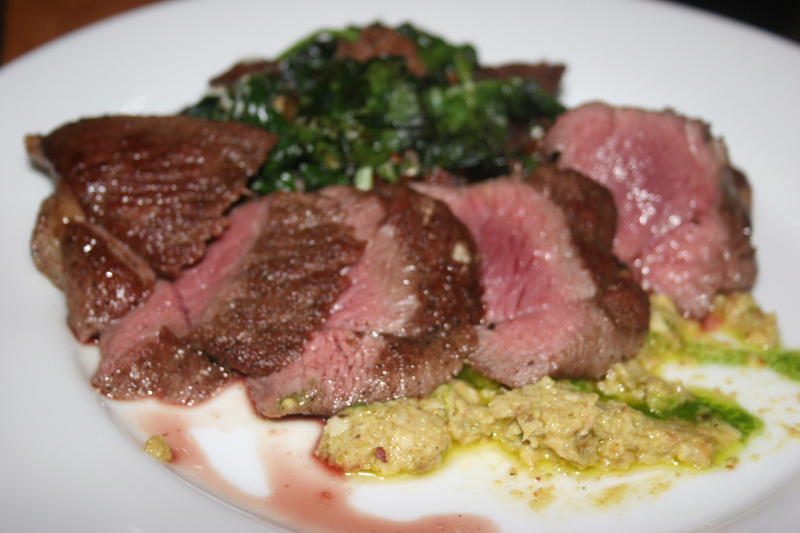 Cumin Dusted Lamb Steak, Artichoke Pistachio Pesto, Merguez and Spinach Fricassee. His medium well dish was just as he had requested and, although I think he still feels the pool was fixed, he at least did not go home hungry. As with most of these “neighborhood” dinners, stories were told and retold for the 200th time and lots of laughs accompanied the meal. 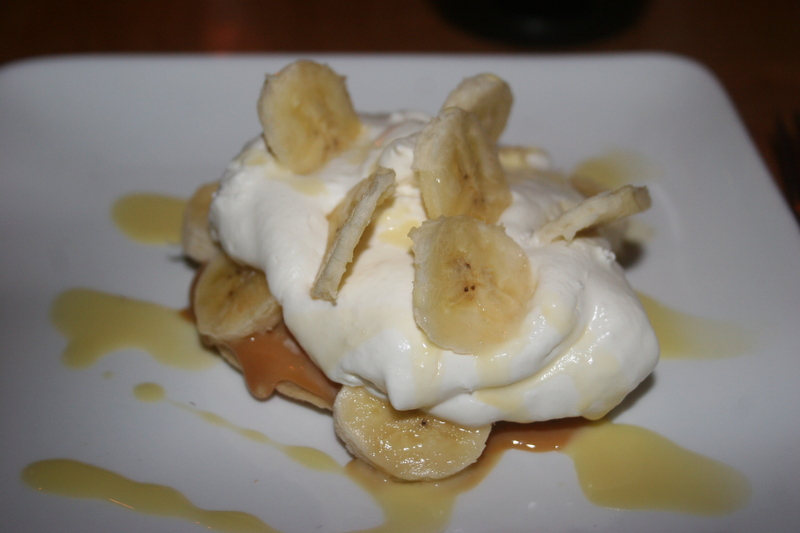 We split two of the desserts , the Banoffee Tart (Banoffee = Banana and Toffee explained Elenore) and the Warm Chocolate Cake with Vanilla Bean Ice Cream. Both of these were very good but I would give a slight edge to the cake which was extremely good. 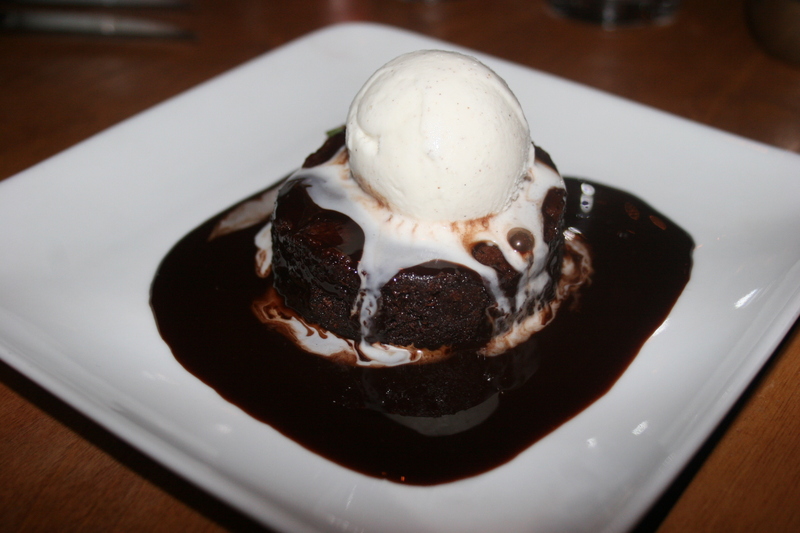 Sycamore is a very nice BYOB with some great menu choices, a warm and welcoming atmosphere and very reasonably priced. The meal, with tax and tip was $41.00 per person.